Resveratrol Forte capsules 250 pcs. Bio+Active Flax-seed-germ capsules 250 pcs. Red Cabbage-germ capsules 60 pcs. Silver has been used for ages as a precious metal. It is indispensable for the human body as a trace mineral, its beneficial effects were utilized by ancient Greeks and Romans, too. Their drinks remained fresh for longer periods when kept in silver cups. The American settlers put silver dollars into the milk, so it did not turn sour for a long time. Why is it curative to drink colloid silver solution? These solutions can be prepared by using a special electrical device. Nano silver and colloid silver can be produced in(to) a water medium, while silver protein can be produced in(to) a protein medium. 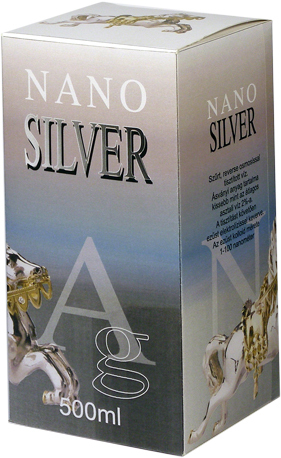 Nano Silver Concentrate is externally suitable to provide the purest antibacterial protection without any side-effects even in hygienically the most critical parts of your living environment. In the garden bacterial or fungal diseases of plants can be treated with it. It can be used to disinfect drinking water, too. -. It can be applied excellently externally on wounds, eczema, itchy skin-rashes, insect bites, warts/verruca, inflammations of the eyes or the skin. Internal use of silver solution is only recommended as a cure! No side-effects of the good quality silver solution have ever been experienced! It won't interfere synergically with other medications, it does not influence their effects. Daily use of colloid silver supports and strengthens natural defence system of the body, the immune system, enhances vitality and prolongs life expectancy. To achieve maximum absorption, take it 5-10 minutes before meals. Use the possibility of silver solution offered by nature to be healed or to keep your environment clean.